I specialize in creating custom workshops for those that are eager to learn more about the art of landscape photography. My private workshops are all about you as I custom tailor the experience to your schedule, your photographic needs, and your skill level. It includes me passing along my photographic knowledge and photographing from what I have discovered to be some of the best locations at the canyon. What Will We Do On a Workshop? 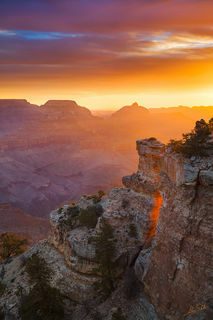 We will visit and photograph from a variety of scenic locations along the rim of the Grand Canyon. Along the way I will cover the techniques I use to get sharp and well-exposed images, how I manage focus and depth-of-field control, using filters, and planning a photo session to get the most out of your limited time. In addition to technique, I also share with you my approach to creating a variety of compositions including wide-angle grand scenics, working with foreground anchors, leading lines, s-curves, layered landscapes, and intimate scenes. If the weather permits, we will also photograph the dark night sky above the Grand Canyon. You will be able to take what you learn here with me and apply it to any location or subject. What Makes These Workshops Special? This is simple, you make these workshops special! Because it’s about what you will experience at the canyon, what you will learn, and what you will create. I look forward to working with you! Read the reviews and see what my past workshop clients have to say about my landscape photography workshops. I have spent over 700 days exploring and photographing the Grand Canyon, from the South Rim, the North Rim and below the rim including covering all 277 miles of the Colorado River within the park. 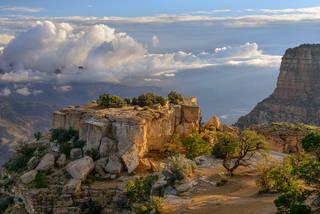 In addition to that, I have lived in the park as the Artist-in-Residence for Grand Canyon National Park. Over the past 10+ years I have gained invaluable experience photographing the Grand Canyon in all conditions including snow, rain, dust storms, and lightning. I want to take that experience and share it with you! 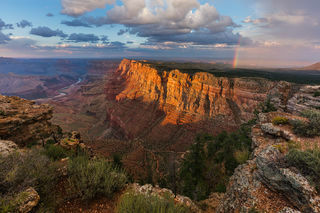 I offer my workshops on both the South Rim and North Rim of Grand Canyon National Park. 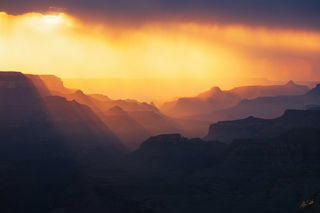 Most people visiting the Grand Canyon go to the South Rim. It's open year-round and has many hotels and lodges. The South Rim of the Grand Canyon has nearly 20 named viewpoints from which we could photograph the canyon. 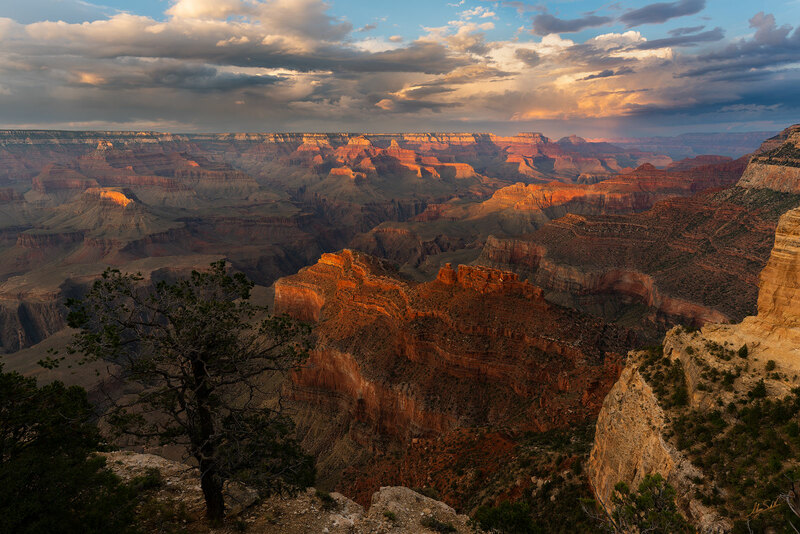 The North Rim is about a thousand feet higher in elevation than that South Rim and has seven named viewpoints, two of which are some of the most iconic in the park. The North Rim only has one lodge and is open from mid-May to mid-October, closing during the winter months due to the remoteness of the location and the massive amounts of snow it gets. I love both sides of the canyon equally. They each have their own unique views, and offer very rewarding experiences for photographers. 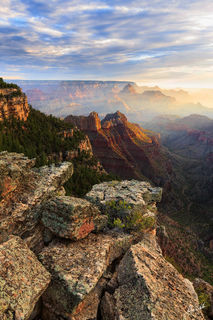 For a first-time visitor I recommend the South Rim as it has more of the "classic" big Grand Canyon views, and it can be easier to find accommodations. 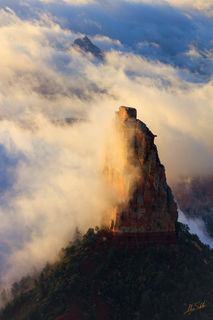 The North Rim is a great place to visit and photograph once you've done the South Rim, it just takes some patience and advanced planning to make sure you can get a cabin at the lodge. If your schedule allows, I highly suggest visiting both rims with 2 nights spent at each. What Viewpoints Will We Photograph From? Any of the viewpoints in the park can be an excellent spot to work from, but the catch is knowing which locations are best as the light and shadows change with the seasons and the weather. For this reason, I do not select locations until the day of the workshop so that we may adapt to changes in light and weather to put you in the best spots possible. Let me know if you’re traveling with family or friends and I can create an experience that is just as fun and informative for them too! One friend or family member may tag along with each paid participant. Private workshops range in length from a half-day afternoon through sunset tour, to week-long adventures. The price for a private workshop fluctuates with the season with half-day trips starting at $475. Please send me a message for current pricing and availability. Let me know if you have any questions, or if there's anything I can do to assist you in preparing for your trip. I want to make your visit to the Grand Canyon a great experience. The Grand Canyon is a place that I genuinely love and respect, and I feel it’s a privilege to share it with my workshop clients.